The History of Middle-Earth is one of the largest works of 'literary archeology', and was marvously undertaken by J.R.R Tolkien's son Christopher Tolkien. During the 1980s and 1990s, Christopher Tolkien edited the vast collection of manuscripts together with maps and illustrations and published most of his father's Middle-Earth writings as the 12-volume History of Middle-earth series. In addition to the source material and earlier drafts of several portions of The Lord of the Rings, these books greatly expand on the original material published in The Silmarillion, and in many cases diverge from it. Part of the reason for this is that Christopher Tolkien heavily edited The Silmarillion to ready it for publication, in places incorrectly because he was unaware of the existence of much material which had come to light only long after publication. 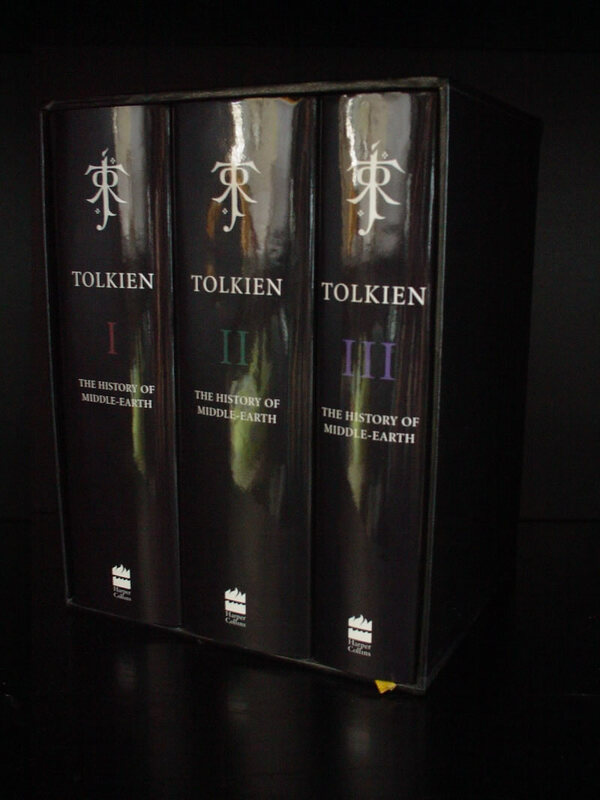 These later books also reveal which parts of The Silmarillion Tolkien developed more than others. Volume I: The Book of Lost Tales, part one. Originally published by Allen & Unwin on 27th October 1983 at 12.50& pound; (5000 copies) and by Houghton Mifflin on 22 february 1984 (4000 copies of imported sheets from Allen & Unwin, and another 30.000 copies from domestically US sheets); A book club edition was made by Guild publishing (Book Club Associates) in London in a simular bnding and dust-jacket as the first UK edition (1000 copies). ; A book club edition was published in 1984 by the Science Fiction Book Club. ; First paperback was published by Unwin Paperbacks on 4 March 1985 at 2.95& pound; (25.000 copies), followed by the first American paperback on 20 february 1986 at $8.95 (20.000 copies); later in June 1992 it was published for the first time by Ballantine Books at $ 5.99.